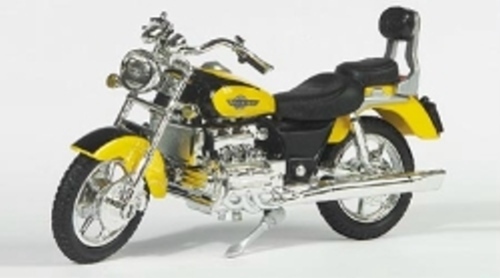 In the autumn of 2001, Schuco added another line of interesting models to its huge range: 1/18 scale motorcycles, following the huge success of the Piccolo 1/43 scale bikes and the larger, much more expensive 1/10 scale models. As it often goes with sentiments, people want to hand this down to the next generation. However, the wind-up toys don't come cheap and are not very well suited for young children. Therefore, Schuco decided to issue a less costly alternative in the shape of low-cost 1/18 scale models. This series has been issued under the name of "Schuco Junior Line". The 1/18 scale translates into models of some 13cm in length (some 5 inches). In the list below you will find the current offerings in this line. It will be further expanded over time.